Maj. Gen David Thompson, special assistant to the commander of the Air Force Space Command, will receive his third star and take on a new role as AFSPC vice commander this week to support military space operations at the Pentagon, Defense News reported Saturday. Gen. David Goldfein, U.S. Air Force chief of staff, told a roundtable forum held Thursday that the service branch promoted Thompson to the three-star position in order for Gen. Jay Raymond to concentrate on managing the command at the Peterson AF Base in Colorado, as its leader. Goldfein added he expects that Thompson’s new duties in Washington will focus more on space programs. 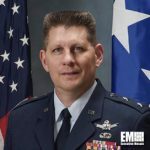 The report said USAF initially intended to appoint Thompson to lead a space directorate that would have been called A11 and based at the military service’s headquarters, but the 2018 defense authorization bill signed into law in December prohibits the formation of that post. He previously served as two-star AFSPC vice commander, based in Colorado, for two years before he became the commander’s special assistant in July 2017.